A fall can be an unpleasant situation for anyone. For a senior citizen or someone with a physical injury or disability, however, this type of situation can be a disastrous one that leads to significant damage. The bathroom is a particularly dangerous area in which falls can happen, for two main reasons: surfaces in bathrooms, including floors, are usually hard and slick; and people generally use water in bathrooms, which can make these slick surfaces even more slippery. Luckily, there are a few fall prevention tips that can be followed to minimize the risk of falling while in the bathroom. If you are at risk of serious injury from a bathroom fall, you should always attempt to use bathrooms that are designed with the safety of their users in mind. These bathrooms often come equipped with safety bars around the tub, sink, and toilet that can be used to grab onto in case the occupant loses their balance or slips. 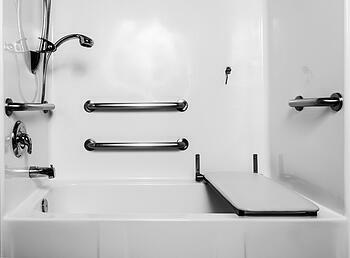 Other adaptations that are often made to bathrooms where fall prevention is important include a lowered tub or shower entrance to make it easier to get in and out of this area, and an elevated toilet to make it easier for physically impaired people to stand back up after sitting on the toilet. Even if your bathroom is not specially-designed to prevent falls, there are certain devices that you can install in the bathroom to help stop these situations. First, make sure that you have bath mats inside and outside of the tub and shower that provide a better grip for wet feet. These mats should also be padded so that they can absorb some of the impact in the event that a fall does happen. There are also decals available that can be applied directly to the floor to ensure that they stay on permanently. For bathing, it is wise to use a shower seat or bench, which will help reduce the risk of a fall while showering. Ideally, bathrooms in a medical facility or rehabilitation center will come equipped with some type of panic button that people can push if a fall does occur. If it is possible, think about installing this kind of system. At the very least, it is important that seniors and others who could suffer a serious injury from a bathroom fall have some way of informing a family member or caregiver when they need to use the bathroom. This way, the caretaker knows to check if everything is okay after a certain amount of time has passed. Bathrooms can be very dangerous for the elderly or those in fragile physical situations, but they do not have to be. With the right kind of alert system and some key bathroom modifications, anyone can use a bathroom without worrying about seriously injuring themselves because of a fall.